A cold glass of ice tea is a surefire way of recharging your senses and quenching your thirst, especially after a long day of school, work, or exercise. If you are looking for a sugar-free ice tea mix that fits into your healthy lifestyle, there can only be Bolere Drinks Bolero Sticks Ice Tea! Bolero Drinks Bolero Sticks Ice Tea is made using pure black tea extract, which has that distinct taste and flavor. This powdered juice mix is made available in convenient stick sachets that fit easily in your bag or pocket – allowing you to fix up a refreshing juice drink anytime, anywhere! 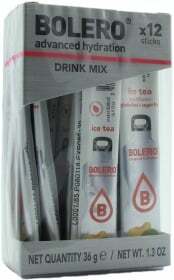 Each stick sachet of Bolero Drinks Bolero Sticks Ice Tea can make up to 2 liters of juice – it's that economical! Get your ice tea fix satisfied wherever you are... don't forget to bring a stick sachet of Bolero Drinks Bolero Sticks Ice Tea wherever you go! Have a question about Bolero Sticks Ice Tea? What is it, what does it do, how and when to use or something else? Ask us. 2 out of 2 found this information useful.